Las Vegas, Nevada has always been a famous place for people looking for pleasure and recreation. For low income families, however, the "Entertainment Capital of the World" is not that much of an amusement. In fact, it is considered to be the worst metropolitan area in the United States. Many would agree that making a living and keeping a roof over your head is becoming much harder these days. But in Las Vegas, it is even more difficult than anywhere else. 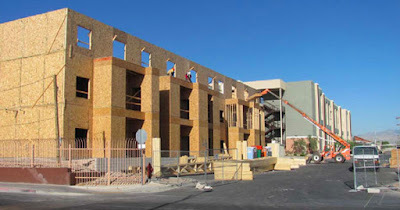 According to the National Low Income Housing Coalition, Las Vegas is named the worst metropolitan area in the U.S. when it comes to housing for low-income families. Among the many reasons behind it are the low-paying jobs in the city. Add that to the fact that it's hard for low-income families to find an affordable place to call home because only a few homes were subsidized resulting in a housing crisis. Around 71,000 Nevadans are extremely low-income. For every one hundred of them, there are just ten affordable places to live. "You can't solve the homeless problem without homes," said Arnold Stalk, the founder of Veterans Village which provides apartments for homeless veterans. In his new efforts to provide affordable housing, he is focusing on homeless working families. It will also include supportive services such as urban farms and a real village. The 100-unit building that will be located on Fremont and Eastern is now in its planning stages.